The building 475 Fifth Ave., left, is shown Wednesday, May 20, 2009 in New York. The 23-story Moinian Group skyscraper across from the New York Public Library, which sold for $160 million two years ago, is one address in "serious jeopardy" of foreclosure, says Dan Fasulo, a managing director at Real Capital Analytics. If a one-bedroom condo can go for a cool million bucks on the Upper East Side, how exactly does a 40-story skyscraper in Midtown sell for just $100,000? Situated on a prime corner in the country's wealthiest commercial market, steps from the Museum of Modern Art and a few blocks from Rockefeller Center and Central Park, the 1330 Avenue of the Americas building sold for close to $500 million just three years ago. But when owner Harry Macklowe defaulted on the $130 million loan, it was auctioned last month for the minimum to a Canadian pension fund unit. A month before that, the John Hancock Tower -- Boston's tallest skyscraper -- sold at auction for just over $20 million. and the 33-story Equitable Building in downtown Atlanta is set to go up for auction next month; its owners owe more than $50 million to the bank and have only half of the building leased. Loan defaults in the worst commercial real estate market in decades have created tens of billions worth of distressed properties across the nation, sometimes forcing cut-rate auctions of landmark skyscrapers. Developers are falling behind on mortgages as tenants leave and can find no financing to cover payments, analysts say. "Just imagine in a residential market, if there weren't 80 percent loans available for everyone," said Dan Fasulo, a managing director at Real Capital Analytics. "If everyone had to buy their houses in cash, the values of houses would plummet everywhere. That's happening on a massive scale on the commercial side." The Sixth Avenue building is among the first of a wave of foreclosures and auctions expected in the next year that will slash sale values of formerly prime real estate, analysts say. "This is a train wreck that's coming in the large office towers," said Matthew Haines, chairman of the Propertyshark.com real estate Web site. Real Capital Analytics, which tracks commercial real estate transactions, counted more than $86 billion worth of distressed properties in the country as of April, more than $6 billion in Manhattan. 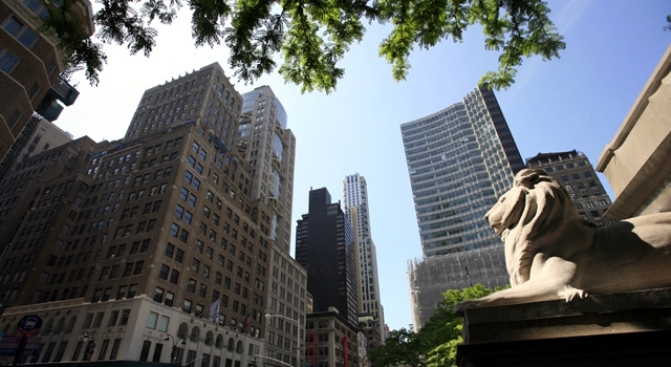 In New York City, addresses in "serious jeopardy," Fasulo says, include a 23-story Moinian Group skyscraper across from the New York Public Library that sold for $160 million two years ago, as well as an office building a few blocks away on Fifth Avenue that Moinian and Goldman Sachs' Whitehall group bought two years ago. Several construction sites that have shut down also are facing foreclosure threats without new financing, like a hotel-condo project with a Robert De Niro-backed Nobu restaurant under construction in lower Manhattan. Sales volume is "historically low. It has never been this low. It has never even been half this low," said David Geltner, research director at the Massachusetts Institute of Technology Center for Real Estate. The only major property sales that are likely in the next several months, analysts say, are distressed properties with delinquent loans. "No healthy owner in their right mind would try to sell a property in this environment," said Fasulo. He said devalued sales of skyscrapers represent "a trickle right now. It will turn into a flood over the next 12 months."